Belgians are like the French only better. They cook with the finesse of the French and the portion sizing of the Germans. What’s not to love about that? Plus they are reassuringly cheerful and rotund which suggests that they are actually retaining what they swallow. Whatever they try to tell you, French women don’t get fat because they have an epidemic of bulimia and sky high sales of laxatives. Wasting good food is depressing. That’s why they are so often grumpy. My favourite perennial Belgian is Chef Daniel Leusch at La Madeleine in Pretoria. For almost four decades he has turned out food and assembled a wine list that is simultaneously classic and contemporary. 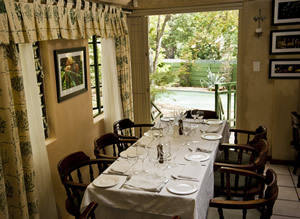 The dining room has more stripped pine and flowery curtains that one might like but the food is consistently superb. During the week, expect challenging and ever changing posh nosh for grown-ups (such as mussels topped with bouffant puffs of saffron espuma). Weekends belong to family-friendly bistro classics like coq au vin and cassoulet. Every now and then there is a small hint that this is not quite French food. The flavour repertoire includes more nutmeg and cloves than one might find in a French restaurant. On my last visit there was a mandarin Napoleon parfait with an elegant sufficiency of speculoos shards. There are two new brilliant Belgians on the block. Chef Jean Francois Schevenel is a 4th generation patisserie producer. His brand new pastel blue Liège Café in Athol Square, Johannesburg looks just like the Art Deco tearoom that the Old Lady took Barbar the elephant to when he first arrived from Africa. The menu offers deliciously retro-chic starter and main course options (such salmon tartare and Chateaubriand) but it is the bread and pastry work that literally takes the cake. And give away the chef’s Belgianness – the Liège waffles have a proper pearl sugar crust. The French like to stuff enriched dough with almonds and sometimes chocolate but after that they tend to lose interest in the matter. The Belgian obsession with wrapping up treats in butter-laden dough knows no bounds. At Liege Café my best bound-and-gagged brioche are the Bonhomme de pate (filled with cinnamon, apples and pearl sugar) and the Roulade pistache chocolat (croissant stuffed with pistachio paste and dark chocolate). Then there is Bruno’s Oven in Hartbeespoort where Chef Bruno Bevrel makes croissants which are plump with a golden exterior that flakes at the merest touch. His sumptuous swirling pain au raisin (soft croissant dough filled with confectioner’s custard and a generous sprinkling of raisins) are the talk of the town. Once a diner has tried the Tarte au Citron at Bruno’s the idea of sampling anyone else’s ever again seems masochistic. So don’t. Belgians are brilliant.